Exisiting dragon robes are far from rare. This one however, really is, due to its small size. 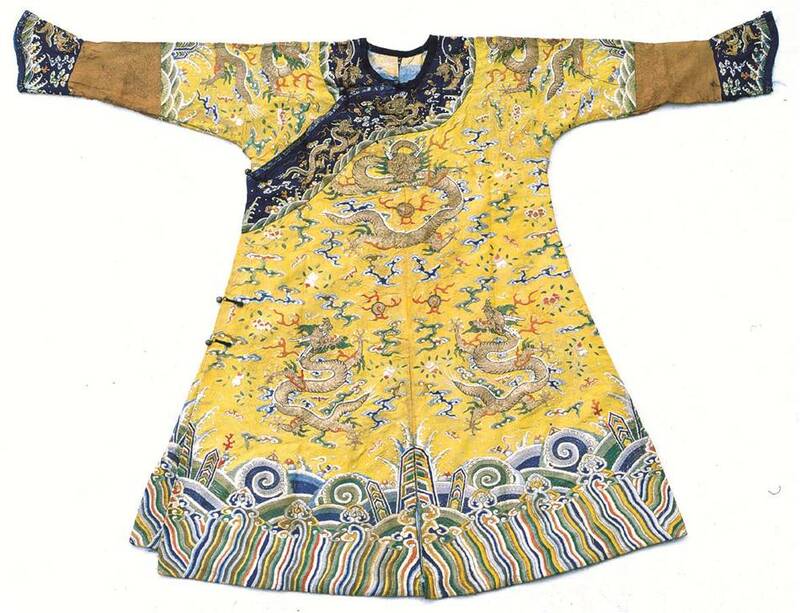 The dragon motifs are exquisitely worked on a yellow silk ground with gold couching technique while polychrome silk threads are used for clouds, bats and flowers. The most plausible explanation for a dragon robe of this size is that it is tailored specially to fit a child emperor. (depicted by Yan Xue, translated by Huiwei Shen). China National Silk Museum, Hangzhou, China. #1858. The dye was extracted from a thread (0.2-1mg) of the archaeological object in a solution of pyridine/water/1.0M oxalic acid as described by Mouri and Laursen . The solution was evaporated to dryness under a nitrogen flow, and redissolved in 50 μL MeOH/H2O (1/1); subsequently, 20 μL of dye solution was injected onto HPLC column. 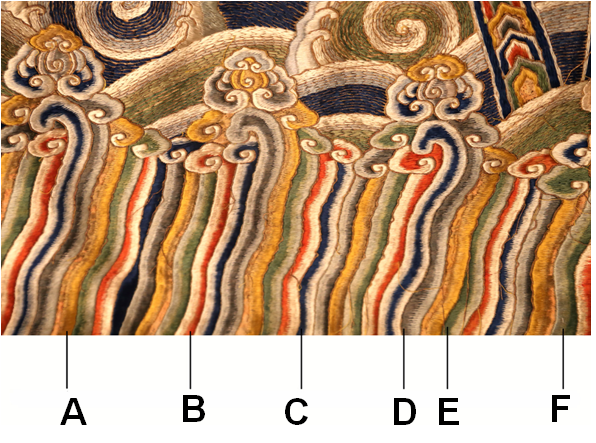 HPLC-MS analysis shows several common dyes were used to dye the Qing dynasty object. Bright yellow threads (part A) were dyed with pagoda tree buds due to the fact that a big peak corresponding to rutin is seen in HPLC profile of the yellow dye. Safflower was identified in red threads (part B), along with Phellodendron spp, which is in good agreement with a dyeing recipe recorded in Tian Gong Kai Wu (Explotation of the Works of Nature, written by Song Yingxin in 1637). Indigo can be used not only to produce a blue color (part C), but also to produce various green colors by overdyeing with pagoda tree buds (part E) or Phellodendron spp.,(part F) Purple threads (part D) were dyed with a mixture of sappanwood and indigo. This page was last edited on 18 January 2018, at 11:49.